I has been ages since I’ve updated this site. Well, I’d like to use it again!! Look forward to an A.C. Galaga makeover and more content! In the meantime, please enjoy this time-lapse of some illustrations I made for a textbook. It’s been a while! My apologies for not posting more often. Totally one of my goals!! I have some news coming shortly! Comic conventions, a new comic, possibly a 24hr Comic Challenge, and more! To tide you over, here’s a nice pic of Squigly from Skullgirls I drew for my buddy John (aka: Johnny Landmine, aka: Magic Sensei). Enjoy!! I said I’d make it my goal to do weekly updates, but that didn’t work too well 😛 Time to get back into the swing of things! Happy holidays all! Hope you everyone had a great time celebrating in your own way! Eddie had a good time. He’s 6 months old and already swimming in a ton of toys. Web comic is still in the works but not as developed as I’d like. Oz, Chris, and I met this time last year and made it our goal to have a site up and running with a new web comic from each of us. After a year, we’ve learned a lot, but missed our goal by a long shot, especially me. We all developed our stories a lot, came up with some strong characters and settings, and made a bunch of comic layouts… just no comics yet. I have to say, I think Oz is the farthest along out of any of us, so he’s certainly been the driving force in our group. I am quite thankful for that. It isn’t an excuse, but having a child this year certainly set me back on some of my creative goals. I’m definitely not giving up on any of them, but I need to redesign my goal plan. Until then, here are a few thumbnail teases of my comic for you to gaze upon quizzingly. Moar?! Yeah, dug this comic up from my uni days. It’s super old and pretty rushed, but I hope you get a kick out of it none the less. Two things. The Legend of Korra has finally finished. It’s totally over and I kind of miss it already. That show had some ups and downs but all in all, it really turned into something great. I’m sad it’s over, but glad it happened. Also, I’m a pretty big Mad Max fan and am super excited for the new movie. An extended trailer came out a few weeks ago and I have to say… YES! I’m in. I can’t wait to see this movie!! So I noticed that Hugh Keays-Byrne who played Toecutter in the first Mad Max is in the new movie. I know it’s not the same character, but it does make me wonder if there is some sort of relation. If there is a relation, I hope it’s subtle like all the others in the series. Gyro Captain is a given. I’m not too sure about Blaster, but if they are the same character, that’s awesome. Benno and Blaster. Same Guy?! By the way, did you know that the guy who played the Gyro Captain also played the Trainman in Matrix Revolutions? Oh, and one more bit of trivia before I move to a new topic. Mad Max 2 was a big inspiration for the designs of ‘Hokuto no Ken’ (Fist of the North Star). Not sure if it was ever stated by the creators, but it’s quite obvious. Know of any other Mad Max connections? Let me know in the comments! Before I finish, I’d like to mention that my buddy David Piper over at Sunday ink just recently finished another fantastic stone lantern illustration based on a picture I sent him. Please go check it out as soon and you can!! Happy new year! See you in 2015!!! Not much honestly. My project isn’t progressing as quickly as I’d like so there really isn’t much to tell you. But, here are a few more sketches I did throughout the week. One of them is unfinished, but it still looks okay and I might keep it like that (the Nina Hagen one). By the way, If I collect enough of these, considering on selling the originals at my next convention. So what has been distracting me this week? Well… You may not know this but I’m a sucker for Saints Row. Had a lot of fun with part 3 and last weekend I finally attempted part 4. Big mistake for people who want to be productive. This is video game crack for me. You get to dress up and customize characters, design your cars, blow crap up, and there’s a pretty cool soundtrack. Sometimes I just enjoy climbing to the tallest building and jumping off. People may think me crazy when I say that I prefer the Saints Row series to Grand Theft Auto. I dunno, I just enjoy plowing through everything along my way to the next event rather than having the restrictions of real life simulation. Also, I don’t want to take my crazy violent gang stuff so seriously. NOW, the main reason I didn’t get this blog out on monday was because I binge watched the animated miniseries “Over the Garden Wall.” What an amazing series! Such a charming tale about superstitions and the importance of family. The animation and music seem to call back to the early 20th century. You can certainly see inspiration pulled from Steamboat Willy, Popeye, Betty Boop, as well as other animations of the time. The music is all in the style of early/pre 20th century folk and ragtime which is absolutely charming. Because of the imprtants of music in this animaiton, you may notice that many of the voice actors are opera and jazz singers. Other voice talents include Elijah Wood, Christopher Lloyd, John Cleese, and Tim Curry. If you haven’t seen it yet, check it out for free over at Cartoon Networks website. Unfortunately if you live outside of the US you’ll have to find other means of watching it. If you have seen it, what do you think? Leave me some comments below. That’s all for now. Tuesday morning is my ‘get stuff together before work’ day so I must be running. Have more for you next week! All the best!! … so with this project there’s certainly a bit of studying for me to do. I’m currently making my way through the first disc of ‘Gorangers’ and have ‘Jurangers’ up to bat. As some of you may know, I’m currently working on a “hero” comic series set here in Osaka. It’s kind of a springboard for random satirical jests about culture, pop stuff, and life. Don’t want prattle on too much about it right now, but enjoy a few sketches. As for the sketch group, one of these two postcard doodles are based on an image from that group. Hopefully I’ll get more involved with the daily doodle suggestions and keep the ink flowing. So Korra season 4 is coming to a close. If you haven’t been following it, try to hit it up because it gets really good. I’m both excited and sad to see the conclusion of this series. The anticipation is a bit much, so thankfully I have the video game to keep me occupied between episodes. That’s all for now. Thanks for reading and hope to have some more art to share with you soon! Lost Treasure of Grimstone is almost finished. It had to be put on the back burner for a while for various reasons. Due to being very busy I only work on it when I can. First printing will be released in Japanese at Kansai Comitia 46 (2015/5/17). Be sure to save the date 😀 English version will soon follow for all you awesome international folk! I’m also working on an ongoing web comic. Also because of the “busy” factor I still have a lot of work to do on in so stay tuned for future updates. Made a bet with my buddies Oz and Chris so there should be at least one strip finished by the end of December. Other Projects: Always a boat load going on and some projects take priority over others. My most recent 5-Track challenge is still in the inking stage. It’s a monster due to the focus on experimental technique (mix of ball pen, crow-quill, brush, ink wash, etc… ) so not sure when that will be done. In a world where I wasn’t so ADD, I might release it as a short with ‘Lost Treasure’. Maybe for the English version (probably next October). By the way, I have a son now! Edward Alan Castree was born last June and he’s been a pretty awesome kid so far. Keeps me busy though. Finally getting back into the swing of things (sort of). He’s rolling over and making a bunch of crazy squeals and coos as babies do. Can’t wait till he grows up a little more and we can start drawing pictures and playing games together. 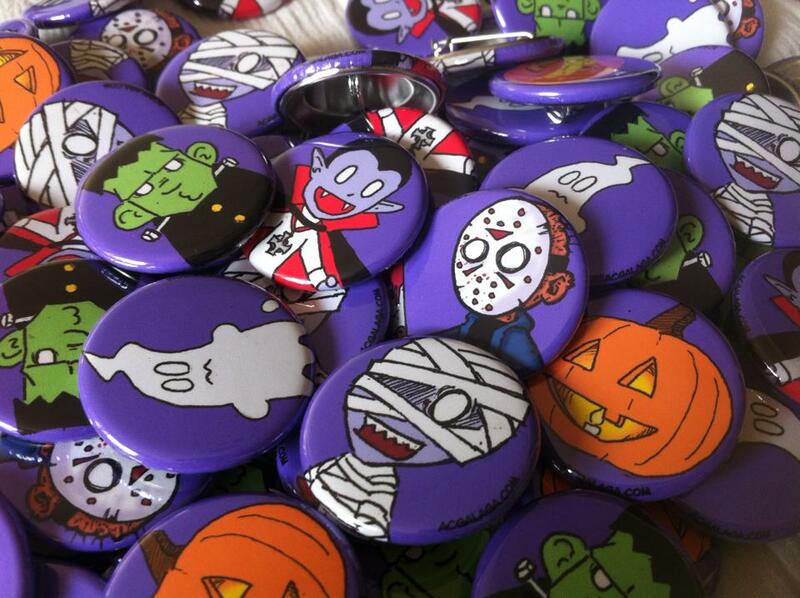 Stickers are sold out but get some monster pins! Coming soon to the A.C. Galaga Store!! I talk about being busy (and I am) but I still find plenty of time to waste. Still obsessed with Android: Netrunner and am always looking to get some matches in. Give me a holler if you want to play online or if you live in Kansai, visit my Kansai A:NR Facebook page!! If you haven’t been watching Gravity Falls be sure to check it out. It’s super cute, pretty funny, and really smart. Also, got a babysitter (the wonderful Thapelo – thank you so much!!) and Rie and I got to go to the movie theater for the first time in a long time. Be sure to check out my ‘Boyhood’ thoughts over at Leterboxd. Quick shout out to David Piper over at Sunday Ink for being awesome! Be sure to go check his latest lantern illustrations. They’re pretty amazing! First off, this post is a big one. It’s been a while since I’ve last updated this site and I want to keep it a habit. That’s why I’ve made it a mission to post regularly ever Monday. Since it will be every week, the posts probably won’t always be this long (bite sized is better) so I’m working on come general formatting ideas. There will also be an entire site redesign so get excited!! Thanks again for reading and hope to give you some more cool comics soon!